Businesses of every type need to train employees in customer service. General customer service training topics, such as conflict resolution, communication and handling difficult customers are useful in every organization. 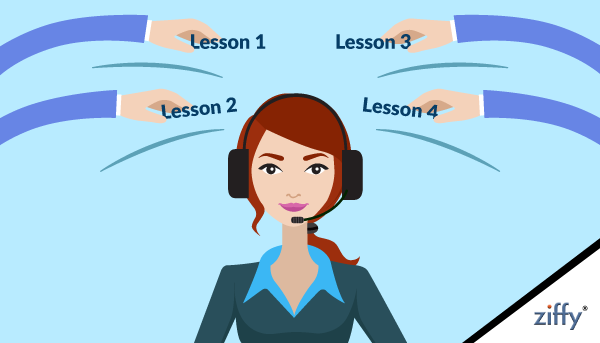 You pay your customer service representatives to interact with your customers every day, but do you train them on how to do this well? Many managers make the mistake of thinking the interpersonal communication comes easy to everyone on their front line, but some reps may need more assistance in this area than others. Customer expectations for service are constantly increasing. Now, customers expect more than an answer to their question. They want their problems solved quickly and desire a personal interaction with a skilled agent. Your new hires should have a comprehensive understanding of your business, product and call center operations. They should also be provided information about company culture, mission, core values and vision and understand their role in achieving business goals. With this understanding, your agents will be more prepared to interact with customers in a manner that is consistent with your business values. Engaging customers means notifying them of policy changes or upcoming promotions that may be relevant to them. It means treating your customers more like a partner in your business, rather than someone who must be serviced every time they walk through your door. Your front line reps are the perfect place to begin educating and updating your customers on information about your company that specifically applies to them. Raise your customer interactions to the next level, and you transform merely satisfied customers into loyal, engaged clients. Those contact points make all the difference in keeping your client base coming back to your business over and over again.